The advances in space technology and future space explorations can be used for improving socio-economic conditions on the planet Earth and for the welfare of global society. 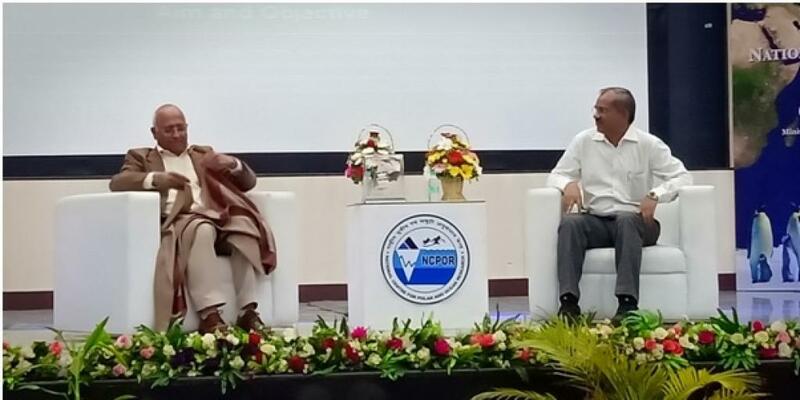 This was stated by Wing Commander (retired) Rakesh Sharma, the first Indian astronaut, while delivering the Foundation Day lecture at the National Centre for Polar and Ocean Research (NCPOR) on April 5, 2019. Sharma emphasised the importance of Indian space programme and the role it has played in the last few decades in different sectors. “Indian programme has advanced both in space science and space applications, and has developed unique low cost space technologies,” he said. The country, he said, is now ready for the next milestone and can play leading role in technology capacity building. India should focus on research in the near-earth space environments and reap the benefits of space technology. NCPOR Director M Ravichandran recalled the institute’s journey which started from small efforts in the form of an Antarctic study centre. Now the institute was a full-fledged research centre engaged in research on both the poles as well as the Himalayan region. Dr Rahul Mohan, Group Director, highlighted scientific research at the NCPOR. Rakesh Sharma, then a fighter pilot in the Indian Air Force (IAF), embarked on his space journey by flying aboard Soyuz T-11 Russian spacecraft launched on 2 April 1984. He had spent about eight days in space. Sharma emphasized on the future requirements for alternate energy resources on earth as well as space. Space research and technologies are dramatically changing the space exploration missions. He further stressed that future space exploration would require us to inhabit the moon, initially, and later Mars. This is a humongous task for any one nation to carry out. Space exploration required lot of funding and should be a collaborative effort rather than a competition between nations. Space exploration should be aimed at unifying the people and with a central point. “We must begin utilizing and leveraging each other’s strengths for common benefits and do a wonderful thing for expanding human civilization.